José Clemente Orozco’s 1930 mural Prometheus, created for the Pomona College campus, is a dramatic and gripping examination of heroism. This thoughtful exhibition catalogue examines the multiple ways Orozco’s vision resonates with four artists working in Mexico today. 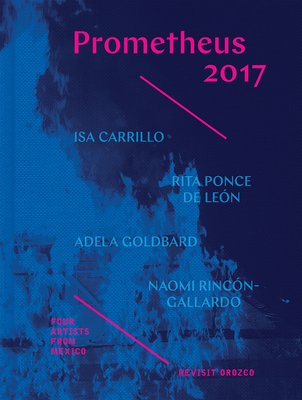 Isa Carrillo, Adela Goldbard, Rita Ponce de León, and Naomi Rincón- Gallardo share Orozco’s interest in history, justice, social protest, storytelling, and power yet approach these topics from their own twenty-first-century sensibilities. These artists activate Orozco’s mural by reinvigorating Prometheus for a contemporary audience. This gorgeous volume presents substantial new scholarship connecting Mexican muralism with contemporary art practices. Three new essays address different aspects of Orozco, Prometheus, and the connections between Los Angeles and Mexico. The contributors take on a broad range of topics, from murals as public art to how Orozco’s work fits into contemporary frameworks of aesthetic theory. The book also includes a chronology, vibrant reproductions, and critical essays focused on the con-temporary artists. Rebecca McGrew is senior curator at the Pomona College Museum of Art. Terri Geis is director of education and interpretation at the Fowler Museum at the University of California, Los Angeles.